At Last a simple functional A3 copier without the whistles and bells. In today's market most machines are offered with a wide variety of features and many customers simply want an A3/A4 copier with little else. Well here it is, a robust A3 copier from Konica Minolta. Small and compact this product addresses the basic A3 copier market that has long been ignored. 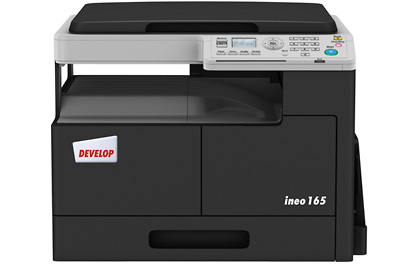 This product is also available as the Develop Ineo 165, same machine different badge on the front panel. The 165 is a basic copier without feature options, but if you need items such as document feeder, duplex or networkable print go to the Bizhub 215 which covers these items using the same basic product. For help and guidance call 0800 1244 199 or email us.